The coveted prize was a million dollars, probably the richest reward for one videogamer — ever. 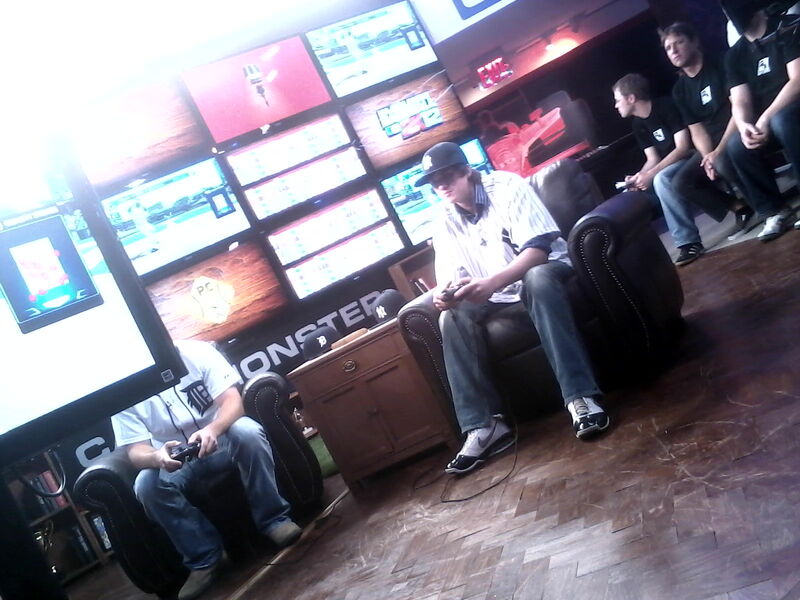 So yesterday, I traveled to Broadway and 4th Street to watch the MLB 2K12 gaming contest. Overly aggressive door people were there, as if Lady Gaga were inside and I was some simpering fan. After I was allowed to pass, I saw Spike TV was there at the MLB Fan Cave (in what used to be the Tower Records store). They complained that I was in the way of their many cameras. I’m always in the way of something, it seems. So I got out of the way. Supermodel Kate Upton was there in the role one of always-a-pro Geoff Keighley’s co-hosts, making mistakes as she read the teleprompter. The thing is, I love the tension of gaming events like these. Unlike the SoulCalibur tournament I recently attended in Las Vegas, this contest was generally quiet – but certainly more fast-paced than a real-life game at Yankee Stadium. The two lucky finalists had been chosen from a pool of 900 players who had pitched perfect games in MLB 2K12. Over a million attempts to pitch perfect games were logged by fans, according to Take-Two representatives at the event. The last two standing, well, sitting in front of HDTV monitors, were indeed the elite of the elite. You didn’t have to be a baseball fan to see the focus in the two finalists’ beady eyes as one player took the field at Comerica Park as the Yankees and the other, the Tigers. Both as pitchers and hitters with controllers in their hands, it was like these two prime competitors were bulls in the ring aiming to injure a matador. But Christopher Gilmore, who was the kind of 21-year-old game nerd who sweats about the face a bit, was a killer with the controller. There was no denying his eye was better than Charles Bates’, his sad foe. By the 6th inning, he had blown out Bates by amassing eight runs to the other’s meager one. It only got worse from there. There was no yelling or screaming or jumping about by Gilmore when he won the million. Perhaps it hadn’t yet sunk in. But, as a Red Sox fan, he immediately asked to take off the Yankee jersey and cap he’d donned as he played. Someone from Spike urged him to keep it on for the cameras. So did some people in the crowd. “Keep it on, man. That’s how it is in New York!” yelled a guy in a t-shirt. He kept it on. The silent Gilmore didn’t flinch. And he had the last laugh, however inward that laugh would be. Gilmore knew, deep down, that in order to be shown the money, playing as the the high scoring Yankees was his best bet. After the debacle that was last season, his beloved Sox achieved much lesser stats in the game. Yes, Gilmore probably should have shut up about disliking the Yankees. Yet it was the punkiest, most energetic thing he said all afternoon. Then again, when you’re a millionaire like Gilmore, you probably don’t have to say anything you don’t want to say — to anyone.